South Devon College is embarking on an ambitious and exciting plan to extend and significantly enhance its buildings and facilities over the next 15 years to improve the education, skills and training offer for the local community and wider area. Since the College moved to Vantage Point, the local area has changed significantly, including major developments at the adjacent White Rock and Yannons Farm. The College’s proposals will build further on the already positive relationship with these sites and their neighbours, whilst respecting the close relationship the campus has with the countryside. 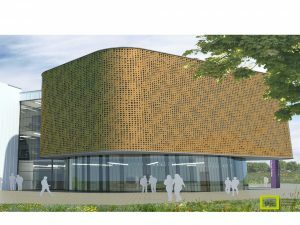 Due to open in September 2019, the innovative £17 million Centre will provide a visionary facility for further education and training support towards ever-expanding hi tech, manufacturing, digital and creative sectors across Torbay, South Devon and wider regions. The Hi Tech & Digital Centre is the latest development in the College’s higher education and skills masterplan, working towards future “university status”, with further proposals being considered including future development of student residential accommodation. Funding to create the world-class facility has been secured from a number of partner organisations including; the Heart of the South West Local Enterprise Partnership (HotSW LEP), Higher Education Funding Council for Education (HEFCE), European Regional Development Fund (ERDF), Garfield Weston Foundation, private investors and the College’s own reserves. The Centre is being constructed by leading local employer Midas Construction, part of the Midas Group. Click here to find out how you can support and inspire the future careers of over 10,000 students at South Devon College. 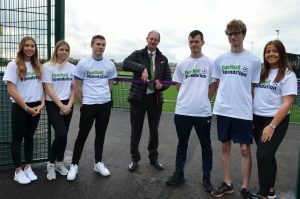 The South Devon College Sports Centre was officially opened in January 2019. It can be found adjacent to the College’s Paignton campus. The Sports Centre compromises a latest generation all weather 3G pitch, changing rooms, community room teaching space and a Multi-Use Games Area (MUGA) pitch. Funding of the innovative Sports Centre is through partnership with the Premier League, the Football Association (FA) Facilities Fund which is delivered by the Football Foundation and Linden Homes. Designed with a strong emphasis on the local community, the Centre is a central sports hub for College students as well as residents across South Devon, who can now use the facilities for a wide range of sports and activities including football and netball. The facility was built by Midas Construction, part of the Midas Group.